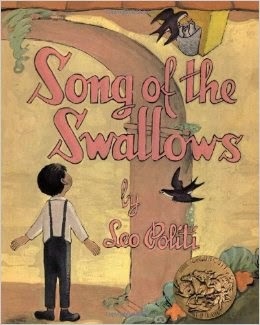 "Song of the Swallows," las golondrinas, is a picture book which won the Caldecott Award in 1949. Written and illustrated by Leo Politi, the story highlights Hispanic customs in San Juan Capistrano, California, that blend nature, Catholicism, and the history of California from a child's perspective. Juan is the main character, a boy of about seven or eight years old. He attends the school by the Mission, and is a friend of the bell ringer/gardener, grandfatherly Julian. Julian is the only adult mentioned in the book, the Mission is the only setting. The story occurs in the timelessness of childhood, so we don't really know if the illustrations depict the 1940's or not. There is no clue by the clothing, activities, or countryside. The Mission and garden are not dated. There are no automobiles, but even today in coastal California, you might go miles without seeing a motorized vehicle. 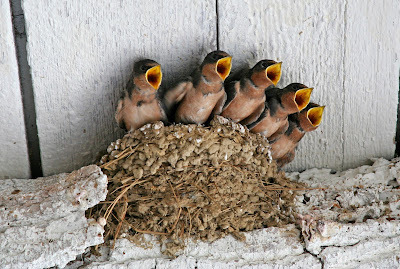 And there is no clue from the birds; swallows don't follow fashion dictates. One of the main attractions of "The Song of the Swallows" is this untainted marvel-of-childhood quality. Julian tells Juan about the settling of California by Father Serra and the Franciscan friars. Every fourth grader in this state (myself included) studied this period of California history, and created model missions, maybe even visiting a Mission. There are over twenty missions up and down the California coast, with many cities named after the nearby Mission, i.e., San Diego, Los Angeles, Santa Barbara, and, of course, San Francisco. I've seen a few and the facilities are well maintained and beautiful. There is no controversy in this book about the treatment of the Indians by the Franciscans. The following link is a balanced biography of Father Serra. 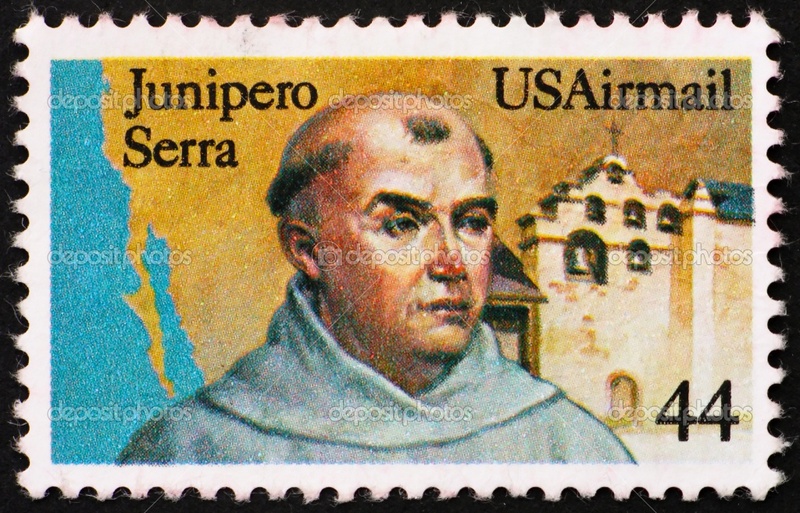 Father Junipero Serra also has a statue in the United States Statuary Hall, in Washington, D.C.
Politi's portrayal of Mission San Juan Capistrano. 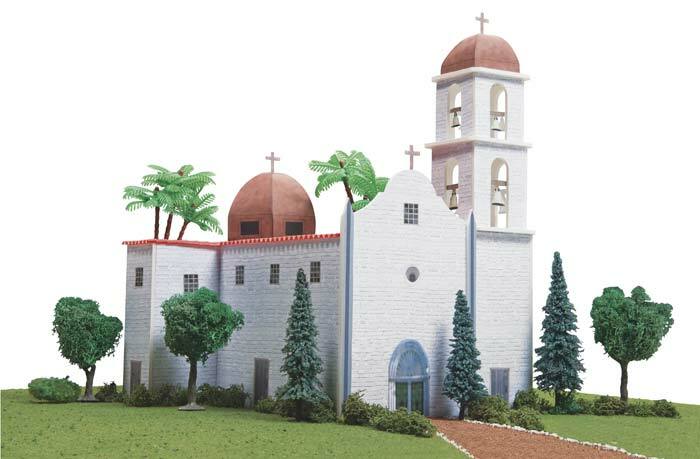 You can purchase this model of San Juan Capistrano for a Grade Four project. Julian, the St. Francis look-a-like. Julian, in little Juan's eyes, is portrayed almost St. Francis-like with the beautiful garden and hummingbirds, pigeons, sparrows and other birds being comfortable around the gentle soul. Juan learns of the mystery of the swallows. How do they know to arrive on St. Joseph's Day? (March 19.) It has nothing to do with Joseph, the stepfather of the Savior (of Jesus, Mary and Joseph fame.) It just coincides with the season the swallows migrate to their familiar habitat. Happy birdie family, happy boy. Why is there a St. Joseph's Day? In the worship schedule for Catholics, each day has one or more saints honored throughout the year at daily Mass with a feast day, or worship service. For example, many communities have the blessing of the animals on October 4, the feast of Francis of Assisi, to honor his saintly lifestyle that was so peaceful that it is said that even wild animals were gentle with him and birds would perch on him. Francis also propagated peace, forgiveness, and taking care of the poor. Francis lived in twelfth century Italy, and wrote some lovely prayers. Happy kids enjoying the beautiful Mission and the birds. As the birds get comfortable, the child personifies the male and female birds as the nest is built, the female incubates the eggs, and the male serenades her with sweet, twittering song. Then both the parents diligently feed the hatchlings, like a happy family. The children thoroughly enjoy the presence of the birds, the spring season, and the safety and contentment of the belief system supplied by the Mission. It is interesting, though, in the story that parents, priests, nuns, teachers or any other adult besides Julian, the grandfatherly gardener, do not make an appearance. Not even an older brother or sister. In due time, the swallows migrate to a mysterious island for the winter. The human inhabitants of Capistrano will wait for their return. Juan and the other happy kids are very excited when the birds return. The birds actually fly to Goya, Argentina. The swallows leave Capistrano on their mission to a mysterious island. Leo Politi, although an Italian-America, wrote warmly of the Hispanic culture in Southern California. He authored several children's books. I met him when I was in college in Los Angeles. He was very encouraging to a young English student. This year in San Juan Capistrano, the swallows are sort of hiding from the big to-do that the residents of Capistrano throw on March 19, St. Joseph's Day. Now the occasion is kind of a mixed metaphor, with a large variety of traditions celebrated, but still a beautiful day out in a remarkably lovely part of the world. This is a wonderful, cheesy song about the swallows returning to Capistrano by Pat Boone recorded in the 1950's, with great pictures of the little birds.